Looks like Walmart now is getting into trash business! Walmart as an attempt to be more greener and to increase emphasis on green energy and practises, has introduced a new cash-for-trash waste collection system in parking lots of several store locations in New Jersey. The concept of recycling machines and reverse vending machines is still fairly new. Only a few college campuses and other locations around the country have actually implemented such vending machines. However Walmart might just be the only one major organization to make a move towards implementing these. 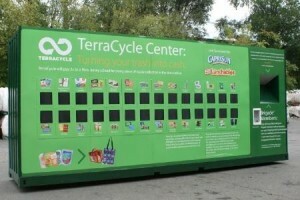 The store collection systems are made by TerraCycle. TerraCycle is also known to make eco-friendly products including bags, coolers, and kites from materials like discarded energy bar wrappers and yogurt cups. The new collection system is now being placed at five Wal-Marts and relies on a converted 20-foot trailers that can accept 28 different kinds of waste. Starting October 1, these trailers will be accepting stuff that usually heads to a landfill. TerraCycle pays three cents for each piece of trash that goes into the system. TerraCycle has already had many millions of kids who have already mailed trash to TerraCycle to raise money. Previous Scientists to Create Star on Earth!